For Immediate Release: Posted On 2/28/2013 By Industrial Magnetics, Inc. The operation had previously required two operators to manually lift the perforated plate from the stack and manipulate it overhead into the press. Utilizing their patented Transporter® technology which, unlike vaccumm cups, is capable of grasping odd- shaped or perforated steel parts, IMI designed a custom solution that integrated six Transporters into a spreader system with an operator control handle. 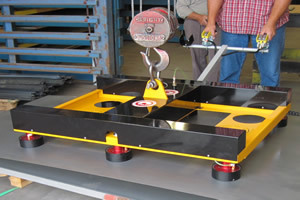 Now, a single operator is able to safely and efficiently handle the load from start to finish with minimal exertion. For more information on IMI’s custom magnetic products and solutions, including magnets for automated or manual sheet handling, please contact 888.582.0822.